Children can be so unpredictable, constantly surprising you with their great passion for something previously unheard of! 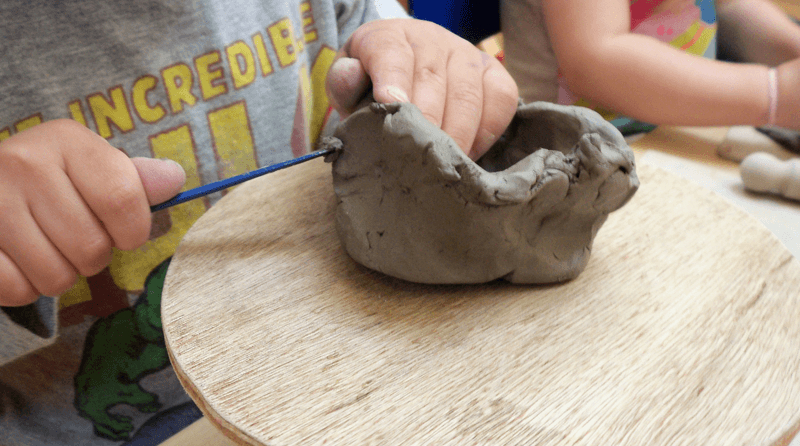 With so many motivating factors for children when exploring resources, much trial and error has brought me to realise that, just as every child is unique, so there’s no single way to inspire children to make their own artwork and flexibility is key. Children are great innovators when it comes to creative play, so keeping a good supply of art resources available is essential. My preschool art sessions are focussed on exploring the possibilities that different resources present, and building children’s familiarity with many materials and techniques. I find that children’s creativity really kicks in when they are comfortable with materials and confident that they know how to achieve their goals with them. 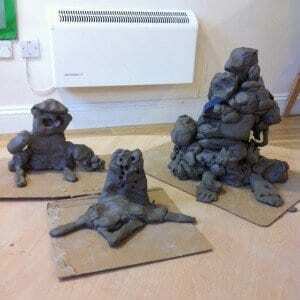 Motivation for exploring resources often comes from real artworks, particularly actual paintings and sculptures that the children can handle and fully experience. In one of my preschool groups, there was a child who didn’t engage much with planned learning experiences but I found out one day that he was enthralled by woolly mammoths. From then on, every artist’s techniques and materials were introduced to the children by demonstrating how to make a woolly mammoth in a similar style. He and his friends quickly got on board and were soon producing amazing paintings, prints, sculptures, even animations with great enthusiasm. Some of them were of mammoths, but many children understood that if you could make a mammoth with the same methods that Cy Twombly used to make flowers, then you could also use those methods to make a windmill, or a spider, or a ghost. Using language and gestures, one can model great excitement about artworks, describing textures, colours, forms and composition. Later that same excitement can be expressed when praising children’s efforts at making their own art. I am convinced that children benefit more from the processes involved in art making than from the artwork itself. An empty “Oh that’s beautiful!” in response to every picture sends the message that children can get praise for scribbling a little bit without really engaging in the learning experience. So I try to praise particular elements of their process, narrating to a child what it is that they are doing that is really working well. Inspiring wonder is sure to result in extensive explorations of art materials and processes. A favourite activity of mine is zoetrope animation. A zoetrope is a Victorian toy that creates moving images and can be used to demonstrate to pre-school children how a series of still pictures comes to life. This can lead to many exciting experiments with animation. A small zoetrope is inexpensive and often comes with pre-cut paper strips for making your own animations. Making marks with some rubber stamps, felt pens or spot stickers can produce a vast array of fascinating animations. Most importantly, don’t be scared to try new things, take risks and make a mess – you can’t be creative when you’re afraid of making mistakes. Model fearless creativity and join your children in exploring art with abandon; show them that making art is exciting, fun and infinitely rewarding. Matthew Kay is an artist educator specialising in Early Years. Alongside making his own art he facilitates contemporary art inspired learning experiences for nurseries and pre-schools in South West London as Eyes Pie Arts (eyespiearts.com).